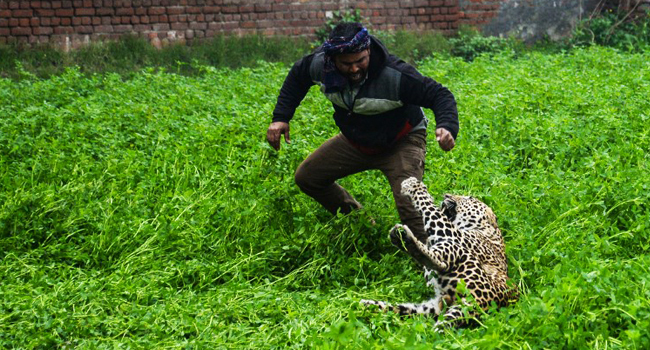 A leopard caused panic in the Indian city of Jalandhar as it went on the prowl for several hours attacking inhabitants before it was tranquilised. Four people were hauled to the ground and bitten by the marauding feline who stalked the alleys and backstreets of the Punjab city of 800,000 people for more than six hours before it was caught. Viral videos showed crowds gathering to watch the cat as it jumped at inhabitants in gardens on Thursday. It was also seen leaping across walls and pushed one man off a ladder as he tried to spread out a net to catch the animal. Those attacked all escaped serious injury. Most of those hurt had been drawn to the area hoping to see the leopard and then became victims of its desperate attempt to escape the city. Some reports said people had thrown stones at the animal in a bid to scare it away to nearby open fields. The leopard pulled one man to the ground and gnawed at his arm before leaping over a nearby wall, seeing another man and wrestling him to the ground as well. Punjab state wildlife officials said the animal had strayed from the hills of nearby Himachal Pradesh state and then reached Jalandhar through fields and forests. The leopard was eventually cornered in a house and sedated, media reports said. Wildlife officials initially tried to capture the animal using nets but later switched to tranquiliser guns. The crowds attempting to see the leopard also made the operation more difficult. Police eventually blocked some streets to keep people away from the district. The sedated animal was put in a cage and taken to Chhatbir zoo. Officials said it would remain under observation for several days before deciding its future.